Sparkles Just Finished Reading The Dog Whisperer………..
Wonder who will be training who? Thank you Ilene! I have recently received quite a few pictures of 4- legged cats and dogs, so if I have not posted yours yet, check back soon. Yours may be next! 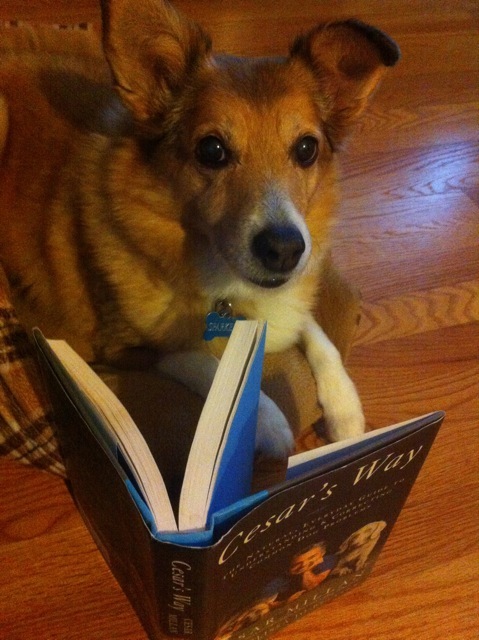 You can email a picture of your 4-legged reader to Susan@Fridaymorningbookclub.com. Still hoping to get a picture of a 4-legged horse? pig? cow? rabbit? Pawfect…how clever. Trev’s picture will be posted soon! Thank you again!! I knew this was going to be a popular item. I’ve been taking pics of Johnny & Pup reading (lol) but now that I know I have such stiff competition I’ll have to take it up a notch. (Wish I had a Mongoose.. that would show everyone!) Although, with any luck, I might get a pigeon… my sills are full! Hi Resa, I like that… a pigeon! I guess I will need a new category, although I don’t know if two legged readers would be the best choice. Can’t wait to see a picture of Johnny and Pup! Oh… Sparkles is absolutely gorgeous!!! It’s so hard to compete in the pet book market!